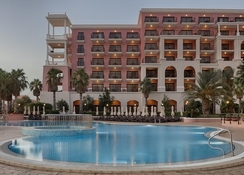 The Westin Dragonara Resort is a 5-star hotel boasting a beachfront location in sunny Malta. The Portomaso Marina is about a ten-minute walk from the hotel. The area is also home to Spinola Bay and the St. Julian's waterfront. Sliema Port is a short drive from the hotel. 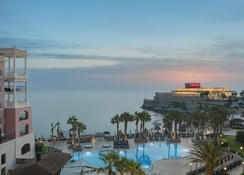 One of Malta's most favourite hotels, the Westin Dragonara Resort is modern, fully air-conditioned with upscale, tasteful decor. It features cosy bars, spacious and elegant lobby with sitting areas and Wi-Fi, indoor pool (14 x 6 m), piano bar, boutique, hairdresser, business centre, well-kept outdoor area with a large sun terrace, two outdoor pools (about 500 square metres, weather permitting) with loungers, umbrellas and pool towels, parking, garage. 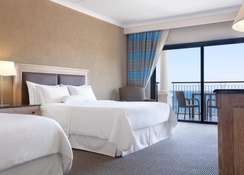 The hotel is close to the beautiful beach lido on the peninsula with a rocky beach. The Westin Dragonara Resort’s location is unique, on a headland in St. Julian's, surrounded by the sea, within walking distance to Paceville with many restaurants, pubs, cafes, entertainment and shopping opportunities. The hotel is close to Malta's Dragonara Casino. The nearest bus stop is about 50m from the hotel. The Malta International Airport is about 10km from the hotel. 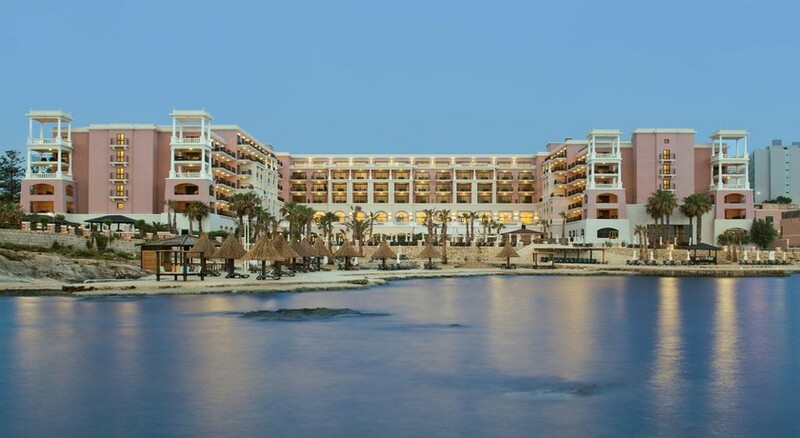 The Westin Dragonara Resort has 340 hotel rooms with air conditioning. The hotel warmly welcomes you to the comfortably furnished guestrooms (family room and bridal suite). All rooms have a bathroom and a kitchen. Bathrobe, hairdryer, whirlpool, toiletries and slippers complete the bathroom. A pleasant seating area is part of the deal. Rooms also offer a minibar, a safe and a desk. There is a washing machine, an iron, a dishwasher, a fridge, a microwave and a coffee machine. Otherwise, your room has a DVD player, a telephone, a radio and a TV for your convenience. 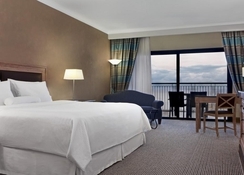 If required, disabled-accessible rooms are also available. The food at The Westin Dragonara Resort includes half board, breakfast, brunch, lunch or dinner. In the morning, either a buffet breakfast or a breakfast is served in the room. The hotel restaurant offers regional, Italian and international cuisine to hotel guests. There are numerous restaurants, bars and clubs in the hotel’s vicinity. The Westin Dragonara Resort has a fitness centre, Jacuzzi, sauna and steam room. The indoor or outdoor pool invites travellers to relax. The spa area offers a range of massages and beauty treatments. Guests can play golf, table tennis, bowling, mini golf and tennis at this hotel. The children's playground and the children's playroom provide entertainment for younger guests. Child care is part of the carefree package for families. Not far from the hotel you will find additional sports activities such as horse riding, surfing, diving and snorkelling. With a casino visit travellers can complete a vacation day. A barber / beauty shop, gift shop, jeweller and clothing store are part of the resort complex. Laundry service, wake-up service, dry cleaning, shoe shine service, postal services and ironing service complete the services offered. Cars may be parked at the hotel for free. Note : The Tennis Court and Multi-Purpose Court are no longer available for use with immediate effect.